By the time your prospects even hit the door, they probably have a solid understanding of the ACN Opportunity, thanks to the work you have already done. But, they may not understand the difference between multi-level marketing and pyramid schemes. Although there are a few similarities, the very fabric of the two couldn’t differ more. ACN has a strong and successful past. We’ve been in business for 25 years, partner with top global companies to provide top-notch products and services, and have a strong philanthropic history – all these things are a reflection of ACN’s core integrity and what set ACN apart from typical pyramid scheme companies. Another tool you can use to educate your prospects on the ACN Opportunity is the Pyramid Scheme video we have developed for your use. 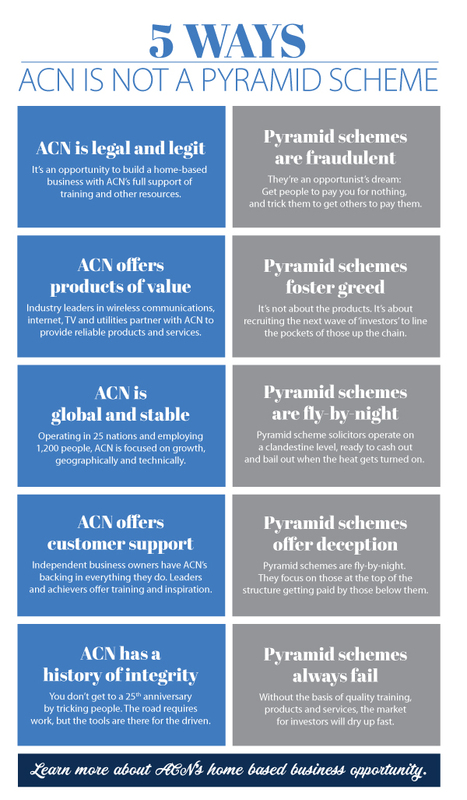 It is important to drive home the differences between the ACN Opportunity and pyramid schemes. ACN is proudly celebrating our 25th Anniversary in 2018 and is looking forward to the next 25 Years!